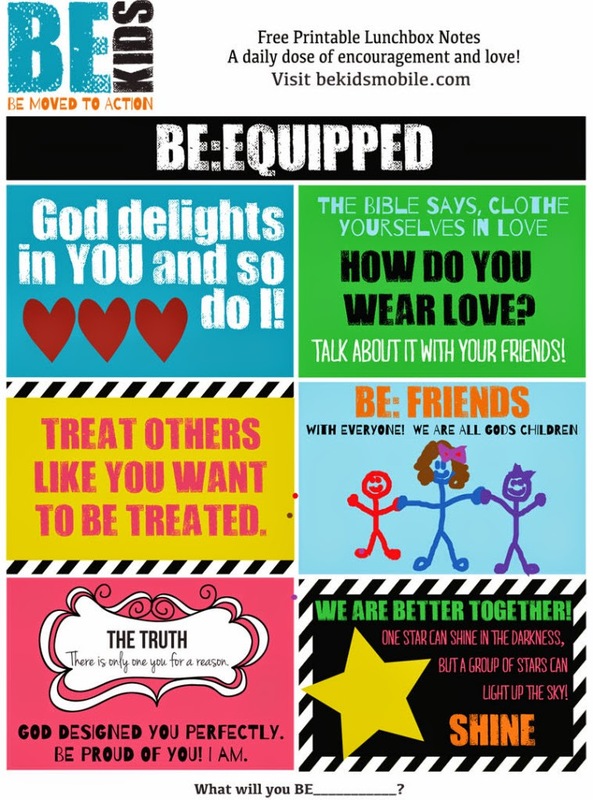 Today on my other blog, About the Children's Department, I wrote about one of the "goodies" in the first Dispatch box from INCM (International Network of Children's Ministry) - a resource from BE Kids, which I thought you all might be interested in knowing about . . . the BE Box! This is a box you can subscribe to and have sent to you each month which is filled with crafts, devotions, lunchbox notes and more - all things families can use to grow closer to God together! But, I also wanted to let you know about these wonderful, free, downloadable lunchbox cards which you will find on Be Kid's website - these cards can be printed and then tucked into your grandchild's/child's lunchbox or backpack to give them some encouragement and remind them in the middle of their school day how much they are loved by God and by you! I love these cards! What a wonderful and simple way to touch your grandchild/child each day and remind them they are loved!